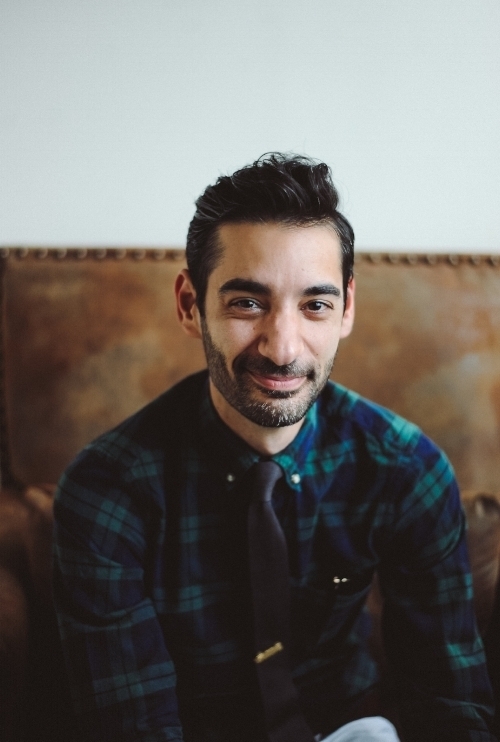 Arab-American poet and electrical engineer Peter Twal will read from his prize-winning collection Our Earliest Tattoos on November 2nd as part of the 2018 Open Mouth Poetry Festival in Fayetteville, Arkansas. Twal is the winner of the 2018 Etel Adnan Poetry Prize, which annually awards $1,000 to a first or second book of poetry, in English, by a writer of Arab heritage. FAYETTEVILLE, Ark. – Peter Twal, Arab-American poet and winner of the Etel Adnan Poetry Prize, will read from his prizewinning poetry collection Our Earliest Tattoos on Friday, Nov. 2. The reading will take place at 7 p.m. at Stage 18 as part of the second annual Open Mouth Poetry Festival. Copies of Our Earliest Tattoos will be available for signing and purchase after the event. A first generation Arab-American whose roots reach back to the small town of Madaba, Jordan, Twal was born and raised in Baton Rouge, Louisiana. A poet and a professional electrical engineer, he graduated with a Bachelor of Science in Electrical Engineering from Louisiana State University in 2010, going on to earn a Master of Fine Arts in creative writing from the University of Notre Dame in 2014. His poems have appeared in magazines such as The Believer, Best New Poets, Kenyon Review Online, West Branch Wired, and elsewhere. Twal's inaugural poetry collection, Our Earliest Tattoos was chosen by Etel Adnan series editors Hayan Charara and Fady Joudah as the winner of the 2018 Prize. Our Earliest Tattoos challenges traditional notions about memory, forcing readers to confront the cruelty of how we blend collective and individual wounds to form constructed selves. The poems are written in sonnet form while at the same time bucking convention. Joudah said of the book, "Peter Twal's poetic energy combines the absurd with the grave, the hilarious with the profound, the wacky with the tragic. In driving lines filled with unrelenting rhythms, his concerns engage the gray zone where the injured, mortal self is also fraudulent. But he does this with kindness, with joy, and stark metaphors, through imaginative lexicon and constructed protagonists." Every year the University of Arkansas Press together with the Radius of Arab American Writers accepts submissions for the Etel Adnan Poetry Series and awards the $1,000 Etel Adnan Poetry Prize to a first or second book of poetry, in English, by a writer of Arab heritage. Since its founding in 1996 the Radius of Arab American Writers has celebrated and fostered the writings and writers that make up the vibrant and diverse Arab American community. The prize is named in honor of the world-renowned Lebanese poet, novelist, essayist, and artist Etel Adnan. The Etel Adnan Poetry Prize is supported by the King Fahd Center for Middle East Studies at the University of Arkansas. This reading is sponsored by the King Fahd Center for Middle East Studies, the Comparative Literature and Cultural Studies Program at the University of Arkansas, and the University of Arkansas Press, in partnership with the Open Mouth Reading Series, a non-profit community-based poetry series located in Fayetteville. For more information on the 2018 Open Mouth Poetry Festival, visit www.openmouthreadings.com. About the King Fahd Center for Middle East Studies: The King Fahd Center for Middle East Studies is an academic and research unit in the J. William Fulbright College of Arts and Sciences at the University of Arkansas. An interdisciplinary and interdepartmental area studies center that offers diverse cultural, intellectual, and educational opportunities for the University of Arkansas community, the Center promotes research and teaching in interdisciplinary Middle East studies. More information about the King Fahd Center can be found at mest.uark.edu. For ongoing news, follow the Center on Facebook and Twitter.